Each June, just before the wealth of summer fruits bursts onto the scene, I go completely rhubarb crazy. Never mind that we have our own patch, or that our vegetable and fruit CSAs both flood us with rhubarb; I just can’t stop myself. Seduced by the ruby bundles in the farmers markets, which until recently were dominated by the beige of overwintered roots, I stagger away with armloads. That's fine at first, before the heat has withered my enthusiasm for baking rustic tarts or roasting the chopped stalks with wine and vanilla. Although a few strawberries are just coming into the markets, rhubarb is still the default spring fruit here. It is my secret shame, though (secret no more), that this rhubarb usually sits in the fridge too long and goes all bendy in the vegetable drawer. This year it happened when, in a fit of optimism, I overbought right before Memorial Day weekend, and then left town before I could fire up the oven; I arrived home to a heap of limp stalks. If this is you, too, or if you are otherwise over your head in rhubarb, all is not lost. There’s a solution: rhubarb syrup. It’s bright, it’s tangy-sweet, and it’s a versatile mixer for potions both virgin and spiked. 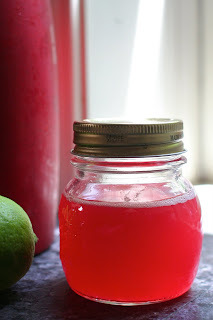 Scroll down to the bottom for the how-to on rhubarb syrup, which can be mixed with a little fizzy water for an all-ages pink drink. We also enjoy the occasional rhubarb mojito, which I stumbled upon a couple of years ago at Brooklyn Farmhouse. Other ideas are a rhubarb basil cocktail from The Kitchn and the rhubarb and Aperol cocktail from Franny's, one of my favorite Brooklyn restaurants. *Tangent Alert* Instead of posting a bunch of boring pictures of rhubarb, I decided to ply you with the lushness of the Brooklyn Botanic Gardens, a treasure we’re so lucky to have within a stone's throw. If you live in the area and haven't become a member, do it! You can go every two weeks and have a completely new experience each time. City kids can roll in actual grass. There are amazing members' nights in the summer, when you can linger until bats swoop down over the lawn, and you might even spy a star or two. Did I mention it's one of my most favorite places on earth? This week featured rose night, a sprawling picnic with live jazz, hats of all kinds, and strolls through the Cranford Rose Garden with drinks in hand to see the colors pop in the fuzzy dusk light. A rosy rhubarb cocktail would have been nice (we had rosé, which was nice, too). One of the most delightful things about roses is their cultivar names. When I was growing up we had Dolly Parton roses in our garden. They were the color of dress-up lipstick, and brazenly perfumed. You could get drunk on those masses of blooms. One of the children in our midst exclaimed "I think I'm gonna faint!" and I suddenly remembered feeling that same wooziness when, as a child, I stumbled through the Bagatelle rose gardens on my first visit to Paris. Put rhubarb and sugar in a heavy pot and add water to cover. Bring to a boil and then lower to a gentle simmer, stirring occasionally. The pieces will break down fairly quickly. Simmer until rhubarb fibers are evenly dispersed into the liquid, around 15 minutes. Remove from heat and pour contents through a fine-mesh strainer into a clean bowl. Using a large spoon or spatula, stir and press pulp to force all liquid through. Clean out pot and pour strained liquid back in (reserve pulp as a topping for ice cream or Greek yogurt, or simply to eat like apple sauce). Simmer for 10 minutes or so, until liquid has thickened to maple syrup consistency. Pour into a clean jar and store in the refrigerator until ready to use. To make a simple spritzer, pour one part syrup and three parts seltzer over ice, and add a squeeze of lime. 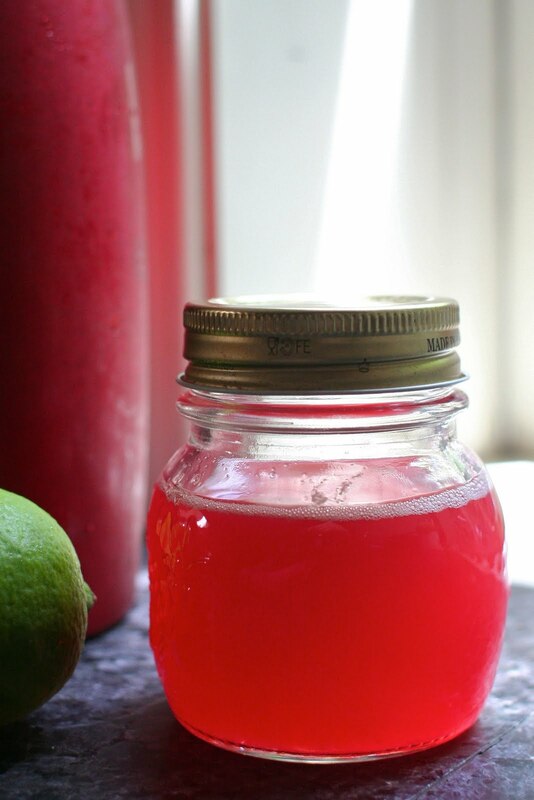 In a glass, stir together rhubarb syrup, rum, a few mint leaves, and a healthy squeeze of lime juice. Pour in soda, and top with ice cubes and a slice of lime, or a swizzle of rhubarb. Note: Consider these amounts guidelines, adding more rum, more soda, etc. as desired. I WANT! It would be delish with St. Germain and proseco, methinks. Yes! Just seeing that the latest Canal House cooking has a similar cocktail, minus the St. Germain; they call it a Primavera. But since you posted this I've had St. Germain on the brain and will grab a bottle as soon as I see one.